Twin Disc of Racine, Wis., develops, engineers, manufactures and distributes power transmission products that make things work. These products are installed in the drivelines and powertrains of farm tractors, road pavers, cranes, oil rigs, firefighting and rescue vehicles, pleasure craft, pumps, turbines and many other products. Most of the products manage and control the horsepower generated by internal combustion engines and electric motors. Due to older equipment that kept forcing Twin Disc to rework parts, the company was unable to keep up with orders. One particularly crucial process on its production line—the machining of transmission housings—was continually being held up by worn-out machines that would force the company to have to prove out parts two and three times to verify they were made correctly. 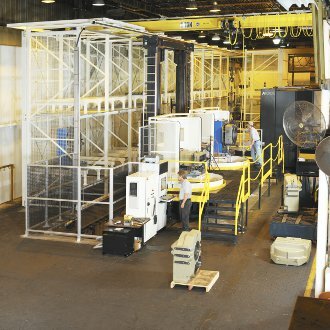 This slowed down its progress, delaying other jobs and customers were increasingly demanding customized or just-in-time parts called for a change. Twin Disc was seeking not only new equipment that would improve cycle times and last for years but also the manufacturing flexibility to handle urgently needed parts. The MMC2 would enable employees to load several parts onto fixtures and then let the machine automation handle the rest of the work. With this automated machining cell, Twin Disc is experiencing improved cycle times, reliability, added manufacturing flexibility and reduced labor. It is experiencing a 30 to 40 percent decrease in cycle times on the problem transmission housing, most of which came from reduced setups and faster feedrates. On one particular part, the automated machining cell has cut the process time in half—from 14 hours to seven hours. With the Makino machines, Twin Disc is producing perfect parts—something that definitely couldn’t be done on the old machines. Twin Disc now has the manufacturing flexibility to switch from job to job on demand to help meet requests for just-in-time parts. With the automated machining cell, labor has also been reassigned to other areas. The company used to assign one person per machine, but now one operator can handle two machines. It is also saving costs in areas it didn’t expect, such as in tool life and tool changes.